This year, the Phillips’s annual free family festival included more enriching activities than ever before and was met with record-breaking attendance. To celebrate, Phillips Educator Rachel Goldberg (dubbed internally, with awe and affection, “Family Festival Czar”) presents a series of posts about what it takes to pull this community event together and the impact on families that makes it worthwhile. This was my 5th year organizing a large-scale family festival at the Phillips, and every year they seem to get more fun and to run more smoothly. 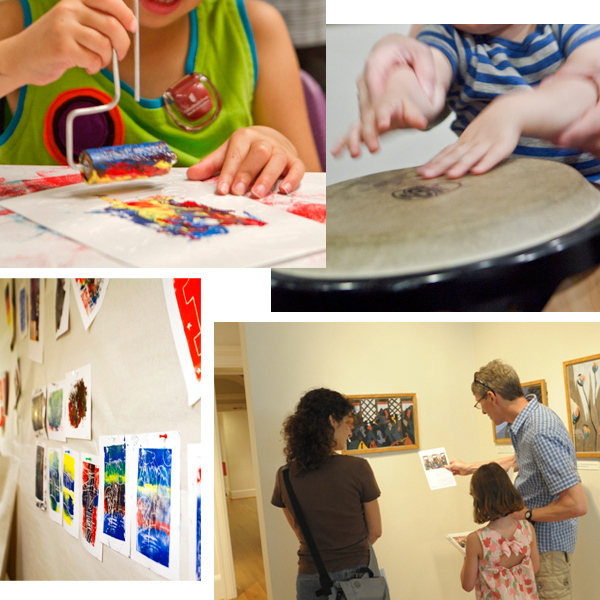 I love seeing the museum full of parents and caregivers sharing their love of art and jazz with the kids in their lives. Watching their faces as they peel back a print in the art workshop, discover an exciting detail in a painting (like the dog on the table in the Luncheon of the Boating Party), or hear live jazz for the first time in their lives makes months and months of preparation worthwhile. Above all, it’s the record-breaking 4,600 visitors of all ages who spent the weekend engaging with art, jazz, each other, and all of us who make this free annual event a rich and joyful experience. This entry was posted in Experiment Station and tagged attendance records, DC Jazz Festival, Dupont-Kalorama Museum Walk Weekend, Jazz 'n Families Fun Days. Bookmark the permalink.